Why Baseball Is So Important To Me. I was obsessed with baseball as a kid. I was mesmerized by the magic feeling of walking into the ball park where everything was larger than life. I collected baseball cards (a collection of several thousand cards that I still have to this day) and I knew all the players stats off by heart. I used to record the games I watched so that I could play them back later and analyze them. 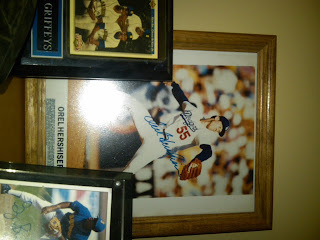 I was also a scrawny kid and I remember one baseball highlight video that said "in baseball the little guy can make it." I would practice outside for hours, many times until well after dark. I would write to my favorite players and some of them even wrote me back! My first job was working for the Seattle Mariners farm team the Bellingham Mariners. I saw Ken Griffey Jr play his first game as a minor leauger as well as his younger brother Craig. My Dad's favorite sport was baseball - he was born in 1931 just outside Boston and he would share stories of the great players throughout history. I also remember him cheering the loudest for me in my games. However there were a few things that really drew me away from the game. The baseball players strike really ruined the view I had of my heroes. Instead of being amazing people I wanted to be like, I just saw them as greedy - plus they took my game away. I also was injured pretty severely, being knocked out several times I developed a fear of the ball. There were some rule changes in the game which allowed for interleauge play between the National Leauge and the American Leauge. I thought that ruined the idea of the World Series (I still feel that way) and it was just a ploy to make more money. There were all the instances of scandal and illegal performance enhancing drugs that skew the time honored statistics that I poured so much of my life into. But perhaps the greatest defeat for me in my love for baseball was that my Dad was always too busy or too tired to play catch with me. It wasn't until years later when I was able to realize that I had been living my life trying to please my Dad all the while trying to just get him to play with me. It had been a difficult road. He and I fought a ton while I was in highschool and early into college. Finally a pastor helped me to realize that I needed to go back to that memory in my mind and forgive my dad as the boy with the ball glove on. I did and since then my attitude and respect for my Dad has increased ten-fold even though we often have differing opinions. The clip may or may not work but it is a general discussion about baseball and why guys are obsessed with it. The girl is talking about how real life revolves around relationships. Then one of the guys answers with this quote: "You're Right I suppose, I guess it is childish but when I was about 18 and my Dad and I couldn't communicate about anything at all, we could still talk about baseball - you know that was real." I can really talk to my dad again and I would say that is thanks to Baseball. If you follow me on twitter and ever get annoyed at my rants about Major League Baseball or the Seattle Mariners when you signed on to learn more about being a Youth Worker realize that maybe my love for baseball and the restoration of my relationship with my dad have a lot to do with what make me the wort of youth worker that I am. So root root root for the Mariners, if they don't win it's a shame. For it's 1-2-3 strikes your out at the old ball game! How I Keep Going as a Youth Worker. One of the ways that I keep myself sane is to journal. In this book I hardly ever account the events of the day, but rather it contains my emotional reactions to life and my conversations with God. When I filled up my last journal I happened to be at the local book store. I wasn't planning on buying a new journal that day, but when I saw this image printed on the cover of a book of blank pages I felt compelled to buy it. I put it in my bag and there it stayed for the next several weeks. I normally write in my journal about every other day, but life had gotten so busy and out of control that I felt like I barely had time to breathe let alone write. There were several times that pulled the book out intending to write, but I couldn't get past the cover. It was as if God was speaking to me through these words. When I finally did get to writing this is what came out. I don't normally share my personal journal so I hope you are blessed by my less than organized thoughts. The Lord will fight for you; you need only be still. Then Lord said to Moses, "Why are you crying out to me? Tell the Israelites to move on." With the Egyptian army on one side and the Red Sea on the other what did this mean to them? They were expecting the worst - yet God was planning the impossible. It is the tension of being still and carrying on at the same time. Exactly what this poster was advocating for. Being still or keeping calm is the attitude that we we need to be resolved to continue living normally in the midst of devastating circumstances. It is then that we allow for the impossibility of God's plans to take place. The past few weeks in youth work the bombs seemed to be falling all around. When the lives of these young people explode sometimes it hits close to home. It hurts and you watch them things you care about disintegrate before your very eyes. It can make you want to throw in the towel and run for the hills. It is then that you need to remember to "Keep Calm and Carry On". How do you get through the bombings in your life? 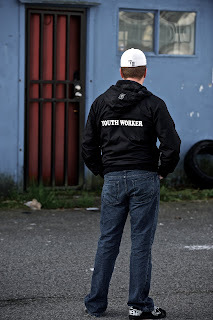 What is a Youth Worker? I was having dinner with my parents when my dad piped up, "So when you 'go to work' what is it you do?" Now he knows that I have been active in some sort of youth work for the past 14 years the past 7 in the same organization. he has come to my info nights, the open houses for my youth initiatives, he has even financially supported some of these endeavors. He knows that I am a "Youth Worker" and yet when he stopped to think about it - he didn't really know what that meant practically. He is not alone. I have been asked by well meaning people when it is that I am going to get a "real job". In any given community there will be people that you could designate as youth workers. There are city youth workers that are primarily tasked with running community recreation programs. There are government funded youth workers that work in tandem to a social worker in providing resources and informal education to young people. There are church based youth workers that oversee programs and events for the youth within a congregational membership. Lastly there are community based youth workers that are tasked by their organization in outreach programs and initiative that are generally motivated by a passionate cause (i.e. faith based, sexual abuse support, family mediation, political involvement, etc). Therefore it can be difficult to simply define what a youth worker is. A youth worker is different than most of the typical adult influences in the life of a young person. They are not a peer, but can be considered a friend. The most difficult thing about defining a youth worker is that when they are most effective they are practically invisible and forgotten. There is a bible story in 2 Chronicles 24 about an 8 year old boy named Josiah becoming king. What does an 8 year old know about running a kingdom? And yet it describes his actions as being noble and righteous. This is evidenced in his 18th years of refining his kingdom back to principles of morality. We know that there must have been advisers to this boy king that helped to shape him and lead him to make these good choices, but they are never named. So it is with youth workers. Our successes are most often silent. This is the reason why I named my oldest child Josiah. It is my joy to remain unknown. Every once in a while a young person will me you in the eye and thank me for walking with them. They may end up forgetting all about me and my help for them as the next crisis arises, but I don't do this job to be successful and show off all the polished kids. I do this job to be faithful to the passion from God in my heart to walk with those that have no one. I know from my own life that it takes a life time to change and youth workers are in the picture for a very short window of time. Maybe in 50 years I'll be watching TV seeing one of the "kids I used to know" changing the world in powerful ways. In that moment no one will be thanking me for my years as a youth worker, but I'll be thanking God I had the chance to be one. How would you describe what a Youth Worker is? Why Youth Workers should adopt a coffee shop. 1. Buying a couple cups of coffee a day is a lot cheaper than rent. Having your own space in which to work is good, but it comes with a price. I have to fundraise for every dollar spent - I would rather buy a couple cups of coffee a day than to see donors money go towards electric bills, heating costs and rent of a space that has limited functionality. 2. The coffee is always fresh and there is a full time barista. Have you ever gone to a meeting in someones office where it tastes like the coffee was made some time in 1999. Of course you have to drink it to be polite. Either that or they have to make a new pot and are gone for the first 15 minutes of your meeting time while they get the coffee ready. I'd rather take the time to meet than to waste on coffee prep. Whether it is a young person, a peer or a potential donor it is much better to select a coffee shop than to invite them to your office for a meeting. It isn't my space or yours - so we can both be at a casual level of comfort which can help open the doors to deeper conversations in a more natural way. 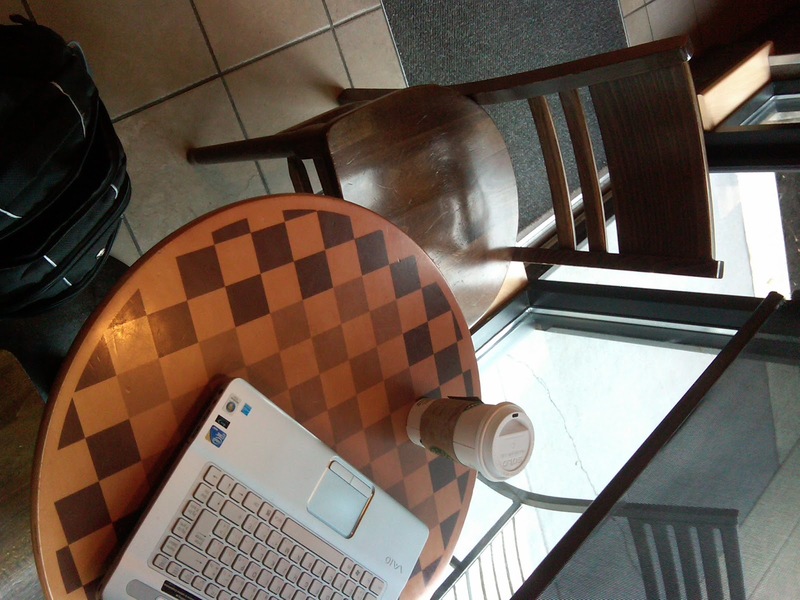 The reality is if I have an office or not I would still be meeting in coffee shops. 4. It lets me interact with more people. If I am stuck in an office all day my potential for running into a young person is severely limited. However if I set up shop in the closest coffee shop to the school where my students attend I can see many of them throughout the day. It also gets me in contact with other customers and the staff. There is a greater sense of community. 5. You are not bound to one place. The way the world functions is changing rapidly. Many business centers are changing to an anti-office structure because of the costs and with the rise of internet hot spots people can access coworkers and documents just as readily if they are in the office next door or in two different cities. I like being able to work in various locations depending on what I need to get done and who I am planning to meet with. So what do you think is having having an "office" in a coffee shop a good plan as a Youth Worker? Take some time to read this post - especially if you are a parent. How would you feel about reading this? How would you respond? There are far too many things remaining unsaid between kids and their parents. I hope there is a chance of RECONNECTING families. This post was written by an anonymous young friend of mine. 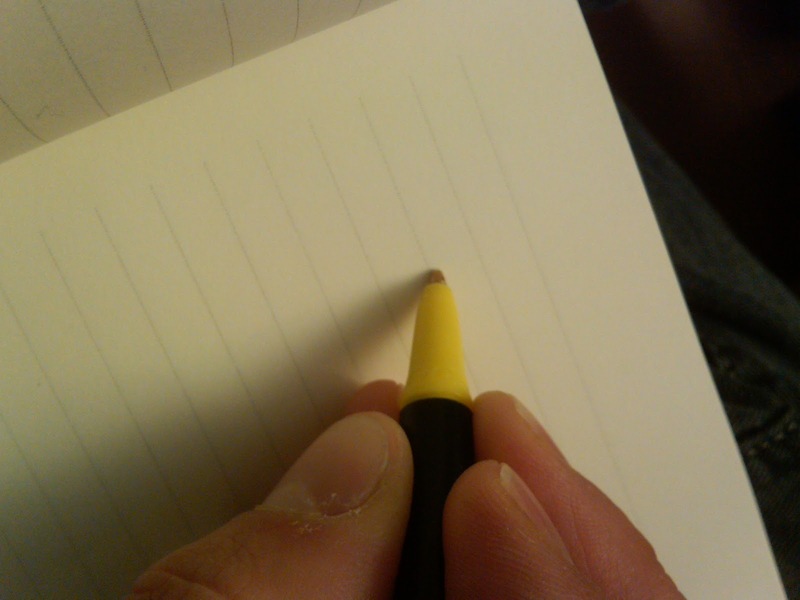 I sit here trying to write you a letter but i can't. Each thought brings with it to much pain. I love you both so much but you can't even manage to be civil to each other and it hurts me so much to see that. My heart breaks at the thought that I will never be able to celebrate a birthday with both of you. I get that you have a history with each other, I'm not a child, but you two were the ones that brought me into this world. You are my parents, a life time responsibility you can't just walk away from. I love you more then anything but i was suppose to learn from you, from what I saw in you but what I see I don't want to become. I want to be someone my kids will be able to look up to and come to about anything. Someone they can trust with anything that is going on in their life. You have raised me into someone I can love to be but most of my growing I had to do without you. God helped me with many of the things I have had to deal with when you where not around and has become an important part of my life. For that I should be grateful to you, for giving me a reason to go looking for him. Youth Resource: "Frog or Prince? 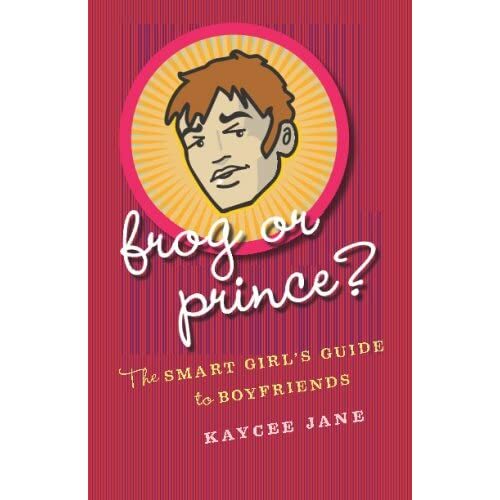 The smart girl's guide to boyfriends"
I had the amazing privilege of getting to know Kaycee Jane over twitter. As we started to interact I became interested in her book. The title, “Frog or Prince? The smart girl’s guide to boyfriends” caught my eye. As a youth worker I constantly talk with young people about relationships. I have come to this conclusion in my experience. Girls are crazy and boys are stupid. Now people that try to defend my statement usually end up agreeing, usually through laughter. I did feel awkward reading a book about trying to find a boyfriend, but to make myself a better a youth worker I think it was worth it. This book is written with a continuing string of short stories that capture the heart of teenage relationship drama. The author then interacts with the stories in helping her audience draw conclusions about possible alternative scenarios. It is my opinion that we can’t change people’s minds for them. However, if we can help them stop for a moment to draw a breath and think, that may be enough to help them make a less heartbreaking decision. I have seen many young people enter into relationships that were based on all the wrong reasons, but when I tried to interject my opinion I was blown off as being to protective, old fashioned or just plain wrong. I’m willing to admit when I’m wrong, in fact most of the time I hope I am. I hope that the warning flags flying around in my mind are off based. Everyone sees the best in others when they are falling in love and they don’t really care to be told about the shortcomings of their boyfriends or girlfriends. This book will help young teenage girls to get to know themselves a bit better so that they will know for themselves if a guy will be a frog or a prince to them. There are a lot of checklists and forms in the book that can seem a little overwhelming, but if used as a guide could be very beneficial in setting up a healthy relationship. Kaycee Jane leads girls to go beyond good self talk and really start to stare honestly at their own strengths and shortcomings. Understanding oneself is really the best place to start in the relationship processes. The better youth know themselves the better they will know what they need and desire from a relationship and why. I loved how Jane outlined needs as those that can be met by oneself, those that are met by others and those that you meet for others. As youth workers we constantly look at needs holistically: physically, emotional, intellectual, social and spiritual. Jane takes these same principals to girls themselves and truly tried to help them outline the needs they have in every aspect of life. Looking at a potential relationship is then sort of like a shopping experience in which you should be looking for which person would help with the best fulfillment of needs. However the book does not merely look to relationships as a process of need fulfillment but moves beyond needs into the realm of convictions. What is it that young people should be thinking about when they are evaluating a relationship? What tools can they use to judge if it is the relationship is going well other than emotions? Jane outlines the elements that teen girls should believe if it is to be a relationship that will work: Without giving away the entire book. The idea here is to question why young people are compelled to meet someone else’s needs, their own identity within the relationship, and the identity of the young people outside the relationship. The book is bold in its approach to young people. For instance jane writes that, “there’s a difference between having feelings of love and truly loving your boyfriend.” (106). She also lists some amazing self reflection questions that every young person in a relationship should be asking themselves. So if you are a young person that wants the best relationship possible or if you are a youth worker that would like some tools to help walk young people through relationship woes, pick up this book. What do youth workers need? I started this blog for several reasons. First of all as a youth worker I encounter some amazing people both young and old who have stories that need to be told. Stories that can inspire some youth workers to continue in their jobs when they don't feel like. Stories that can encourage those that have invested into the work of impacting a generation from the inside out. Stories that help communicate the real soul of youth culture, not merely the facts and trends. Second because I was frustrated at the lack of resources available to me that actually helped me to become a better youth worker. There simply is not much out there that is actually relevant to someone that spends most of their time withe young people and is overwhelmed by situations that they encounter. Thirdly. I have a desire and a passion to teach others. If you are new to youth work or just need some new ideas and inspiration I want to help. I struggled over the tension of trying to make a name for myself as I climbed into the blogging and social networking worlds. So I asked God about it and he said merely "teach". That I can do. What I really want to know is what is it that you need? But I know that since I don't have everything figured out, that there is a safe bet that you don't either. Lets stop reinventing the wheel and get the conversation rolling. Can anyone hear me? YFC/Youth Unlimited in Langley is conducting a survey of local youth needs. LANGLEY, B.C. – With the rapid shifts in youth culture in the lower mainland, local youth workers from YFC/Youth Unlimited are conducting a community survey to determine the needs of the young people in our community. The dream of the YU team is simply that the youth of this community would have the means to live a healthy life: physically, emotionally, intellectually, socially and spiritually. “In order for us to help ensure health for our young people,” Ferguson stated, “we must know what areas they need the most help in.” For this reason Ferguson and his team of youth workers are urging for the community to assist them in gathering information that could help shape youth programs in the area for years to come. Langley Youth Unlimited is looking to expand our work. If you are a Youth in the Langley Area we would appreciate your input. If you fill out our survey you will be entered to win an iPod Nano. If you are a Parent, a Faith Leader or a Community Leader in the Langley area your input is also greatly appreciated. Please fill out the appropriate survey below. Pass this survey on--A second iPod Nano will be given to the person who helps us the most! If you would prefer to arrange for an interview with one of our staff please email us directly. Community leaders in Langley who are also willing to help us gather information are welcome to take a survey as well. There is no contest to enter, but your answers can make a difference for youth in our community. If you would rather arrange for an interview with one of our staff please email me directly. I sat down on a nice warm day with a bowl of ice cream in my hands and watched a miracle in front of my eyes. A young man sat across the table from me and handed me a paper with the title "What does God want?" On this paper were notes he had written and even a diagram to explain what the words meant. As he was sharing I was having flashbacks to previous conversations with this same guy about his desire that I never speak of God to him again. He told me so with some pretty colorful words mixed through the sentence. I respect people's requests and honestly I can't make them choose God. God hasn't asked me to be successful, but to be faithful. So I didn't give up on the friendship with this young man, but I did give him his space on these issues. So that's the miracle. I didn't do anything and the connection that this teen has with God is stronger than anything I could have forced upon him. I asked him if I could share his words with you and while you may not know the whole story of what makes this so amazing, take my word for it - it is. In my opinion God wants us to follow him. We sometimes are angry at him and defy him, but he chooses to love us. He gave us freedom of choice. We can choose to follow him, we can love him, hate him, mock him and love him again. There is lots of evidence where people choose not to follow God. Adam and Eve for instance ate the apple even though God told them not to. It seems like people think they know what is best for themselves. But God's plan is whats best. I find it amazing we still get the freedom to choose, but don't deserve it. What does God want? Well he wants us to follow him by choice. As people we will never understand what God wants. Maybe its love he wants from us. That is the only conclusion I can think, for his children (or followers) are to love him, not because he forces them. No he wants love from his children because they choose to LOVE him and give him everything.